I’ve recently begun offering the True Black Moon Lilith Natal Report again. My work with Lilith treats this misunderstood point with the respect that we as humans deserve. Shaming the natural feminine in all its forms, as most who are talking about Lilith are unwittingly doing because of thousands of years of patriarchal conditioning, shames us as humans. It’s time that we cease remain willing to hear that Lilith is a demon, the mother of all demons, destructive, and evil. The natural feminine is, feels, and experiences. The natural masculine shapes, directs, and controls. We have each energy within us, and we’re in a global, long-term rebalancing of these energies within us. When we let each do what it does naturally, we will automatically bring that balance and wisdom to how we live and create the world. 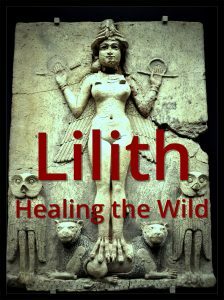 My approach to Lilith is meant to support that rebalancing, and is life-affirming about how you’re wired as a human who’s also an animal, a mind in a body with a heart. The gift that comes from my approach to her is that you see how to create validation, acceptance, compassion, passion, autonomy, and self-determination in your own life, moving beyond the limitations of the patriarchal conditioning that surrounds us and – to many – seems to still have so much power. We can break the power of the patriarchy by choosing one by one to live in tune with and accepting of Lilith within. The report itself contains an essay on the history we’ve been living through that has shamed Lilith, the Lilith myth (social instruction) vs. archetype (how we’re wired and live), why the mean position that most use is worthless, and the astrology of your true Black Moon: house, sign, natal aspects, and major transits and progressions for the next year. At the link below, you can read what numerous clients have reflected to me after reading their reports, as well as astrologers and authors Steven Forrest and Lynda Hill. Note: All orders received by the end of December 22, 2016 will be delivered by the end of December 24th.